Wow, has it been a month since my last post. I’ve been really busy lately. We had the big hail storm after Memorial Day which has caused some extra work to come my way. My roof was totaled in the storm along with just about every other roof in the neighborhood. We are using Elite Exteriors; a family member on my wife’s side is part owner. 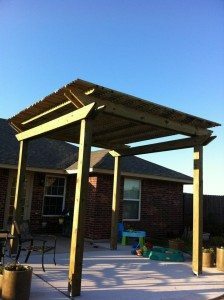 He has been doing roofs for a number of years contact David Shaw at 405.468.6289. Since my last post I have built a portico. It is built out of pressure treated lumber. I think next time it doesn’t need to be built so high, as I have had to go out and tighten it up as the lumber has dried out, and it just seems that being about a foot lower would be better. I did what the customer wanted and all that matters, is she’s happy. I also have been working on a laundry room remodel; well I finished that this week. There are still other things to be completed at this house as they are putting it on the market next week, mainly painting. Two weeks ago after getting back from Cub Scout camp I started a bathroom remodel. I ripped out the entire room and started over; the owner wanted a claw foot shower tub unit. Because of the room size I had to wait to start this project, because the tub was back ordered for over a month, the only place I could find it was at Vintage Tub and Bath. Also lighting was changed and walls were removed. We are putting in 16 x 24 tiles, these are the same ones, and I wanted to put it in my own house until I had to pay taxes this spring. When the project is completed I will have more pictures. I also built a whelping box for a lady last week end. Thanks to Mighty G Computer Solutions for fixing my computer and recommending Carbonite, as my hard drive died last week, I have only lost one email account that I can’t remember the password to. I didn’t use it much, so no big deal. If everyone would just email me at shane@shaneshandyman.com I will only use one account from now on.